Rumors went around for some months, but yesterday it was made public: Aaron Betsky will be the new director of the Netherlands Architecture institute. He will start working in June this year. 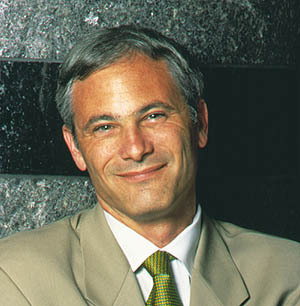 Aaron Betsky (1958) will succeed Kristin Feireiss who has been director of the NAi since March 1996. From June onwards Kristin Feireiss will be director of the International Architecture Biennial, which starts in Rotterdam in the summer of 2002. We don't want to be too optimistic already, but it seems that the choice for Aaron Betsky is a good one. Betsky has a lot of experience as museumcurator, is a well known and sharp critic of architecture and design, wrote some extraordinary books, he is a foreigner (which seems to be a must, don't ask us why :-) and most importantly Betsky knows the actual situation in the Netherlands and even speaks the Dutch language fluently, because he grew up in The Netherlands. Since 1983, when he graduated from the Yale School of Architecture in Connecticut, Betsky has had many publications to his name. He has worked as an author and editor for various architectural journals and is a member of the international lecture circuit as an architecture critic. He is or has been associated as lecturer with a number of universities. Since 1995 Aaron Betsky has been curator of Architecture, Design and Digital Projects at the Museum of Modern Art in San Francisco, USA.